As with every new year in fashion and style, there are certain trends that would be envisioned to be prevalent in menswear; either due to the creative direction of the designers, or based on demands for specific items that can be used to forecast what would be trendy in the new year. From Dad Jeans, graphic knits, pastel, to as simple as a cropped pants, there are a whole lot of menswear trends to be expected in the year. I do not necessarily believe in trends as it is very key to have an understanding of what looks good on you, and what doesn't. However, menswear can be somewhat "conventional", (having a few stereotypical t-shirt, flannel button-ups, indigo jeans, and a lot of casual shoes). This is more reason to have a look at what's trending in menswear, to inject a bit of life and energy into your wardrobe, and to creatively style pre-owned outfits to have a new outlook to style. 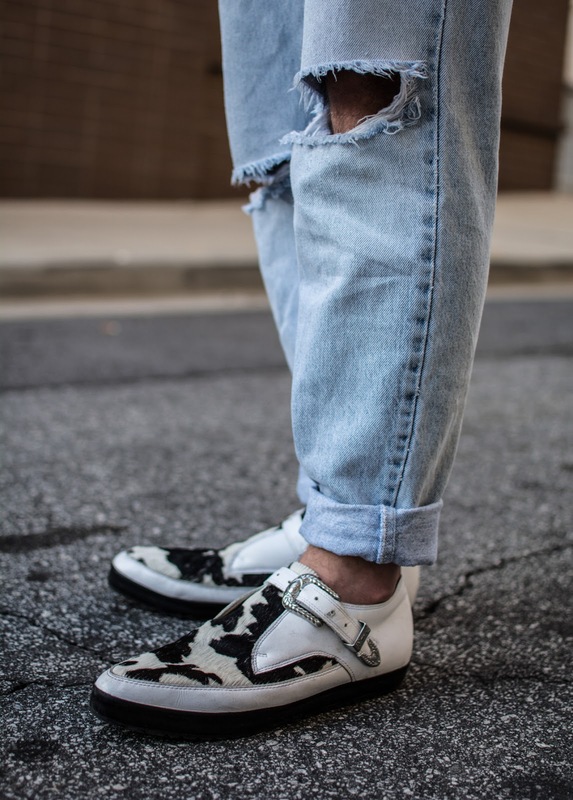 Without much ado, I would love to share a few of these menswear trend that got my attention and I feel they are trends that would resonate well with virtually anyone's wardrobe. Over years and seasons of style, denim is one essential staple to every guy's wardrobe- so it's no surprise that it's made it to the top of the list. Though, to switch up you denim game this year, it would be preferable to opt for a lighter wash of denim, especially the stone-washed denim, which is an amazing denim classic. The cool thing is that the lighter shades are just as versatile as the good 'ole indigo blues. It can also be styled, either the casual way of styling denim, or your smart-casual way of styling denim. For a trendy look, switch your dark blue denim for a lighter shade. Looking for a way to infuse a pop of color into your wardrobe? The pastels are you go-to. The pastels made their way into menswear sometime in Summer/Spring'17, and ever since then, it had become a menswear runway essential. You can switch your regular suit colors of grey, dark blue, and brown to baby blues, mint greens, coral, etc. They are a more timeless alternative to primary colors. If you're not comfortable with doing a full-pastel look, you can always pick a pastel item over a dark tone to complement both color combination. Well. Well.. Welcome to the Jungle. Once upon a time, animal prints were mostly worn by women and were dreaded by men, until Stella McCartney (a recent newcomer to menswear design) made her entry with the leopard prints for men; and every other designers (H&M, DSquared, Topman) caught the jungle fever. You can start with a simple leopard print shirt and pair accordingly, or you could go the monochrome route with zebra prints. Whatever your choice of animal prints are, don't be afraid to unleash your "inner animal". Do you recall when older folks looked at you awkwardly because your pants were at ankle level.? (...I dunno about y'all but I got that look a lot). Apparently, tailored pieces are beginning to transition from formal to casual, and with cropped pants, you get the best of both worlds; the structure of the formal fits with the relaxed look of the casual fits. For a more trendy vibe, go for a pinstripe linen cropped pants, and can pair it with a jumper or a t-shirt. You may not need to go cut all your pants to be cropped, as you can fold the cuff to get the desired length you want. Talking about length, it is very important to take the length into consideration. If it's too long, it won't be obvious, and too short, it may seem like you've grown out the trousers your mum bought for you when you were younger. All the same, don't be afraid to show a little bit of the moisturized "mankles". 5. BYE GRAPHIC TEES..! HELLO GRAPHIC KNITS..!! 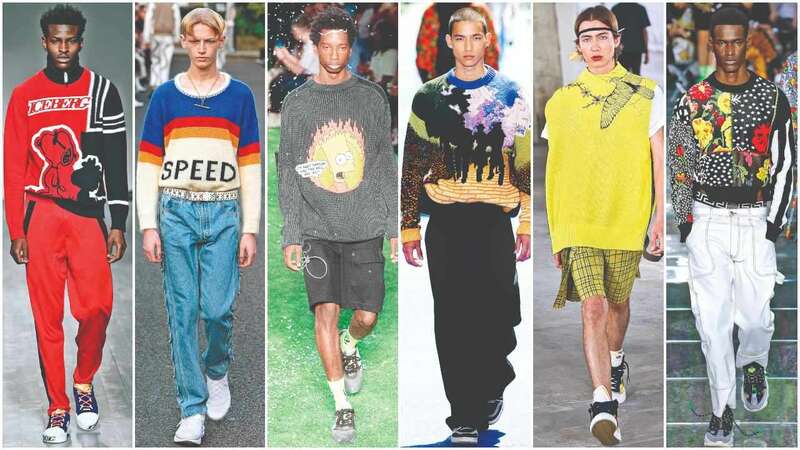 At a time, we were quite cool with graphic tees, until we witnessed a new crop of graphic knits by Virgil Abloh for Louis Vuitton SS'19 collection. Even though this isn't an uncommon feat in menswear, as we had graphic knits from Maxhosa by LADUMA in the Lagos Fashion Week recently. However, there would be a nice switch to this trend with statement-making, street-inspired imagery. I can't particularly say if this trend would be weather-friendly, but then the nature of the fabric and knit should be taken into consideration when pulling off this trend. What Menswear Trend Are You Looking Out For This Year.? Which of the listed ones would you like to incorporate this year.? Do share with me in the comments..
Kene with the sauce. I love the Patel! and yes to men wearing animal prints, though in moderation. Thank you for sharing this, I'm just going to point Bae here for style inspiration. I'm a graphic tee kinda girl so naturally I'm titling towards the graphic knit. Hehe. Oh that’s great. I’m sure you’d love graphic knits, the same way you love graphic tees .